Don’t worry, I know I still haven’t posted my last dental sequel and I will definitely be doing that soon. I just had to share this unbelievable case with you first. This will also give you a brief break from the gory dental pictures. We have endured a very chaotic working schedule in the past two weeks. We have seen a huge and interesting case load and been swamped with emergencies and so I haven’t had time to blog. 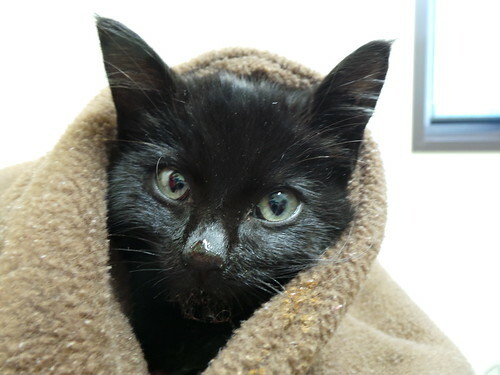 Last week, my colleague Liz had just examined a stray kitten that was picked up the night before. It was found next to the bacon factory and a very compassionate man had caught her after his late night shift. She hissed and carried on but he knew she was too tiny and weak to fend for herself. Liz was concerned the kitten was suffering from a very serious umbilical infection. She wanted my second opinion. I had never seen such a bad case of an umbilical stump infection. 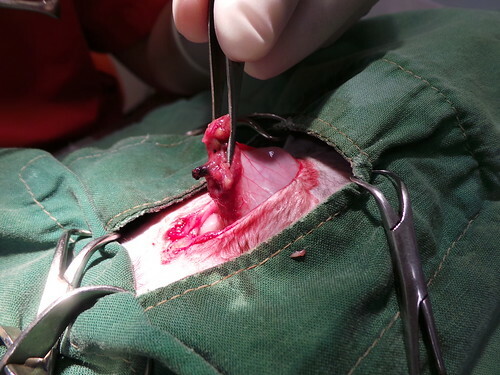 Palpation revealed the infection was protruding deep into the abdomen. We jointly decided to trim the stump that was poking out and treat her supportively. The kitten became more reactive and meowed in pain as I tried to grab the remaining bits of the stick poking out of its abdomen. 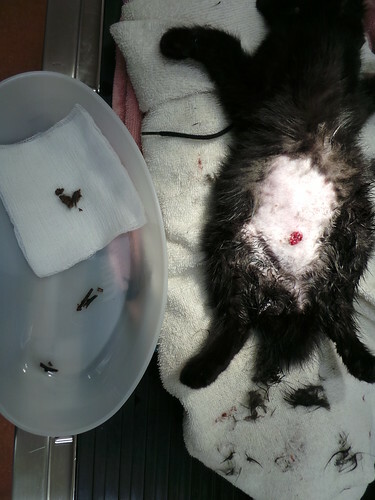 The local anesthetic we infused into her wound was still not enough to keep her still. Liz went back into the consultation room to notify the clients about the progress of the kitten. She informed them that it required urgent surgery and her prognosis was very poor. 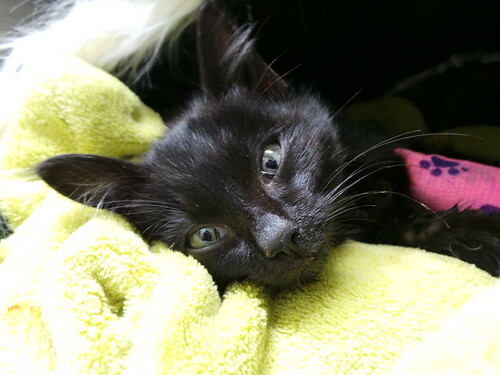 Given it was a stray rescue kitten, Liz offered to do the surgery free of charge on the condition that the clients will cover the costs of the medication. 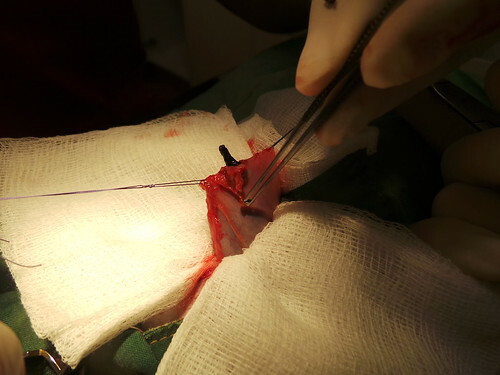 The kitten was immediately anesthetized We had both secretly hoped that the rest of the stick was merely lodged into the abdominal muscle wall and so we could avoid a massive surgery and anesthetic on a much debilitated patient. We quickly discovered that an exploratory laparotomy was inevitable. I mean the kitten was even smaller than our kidney dish. There was no obvious sign of peritonitis. 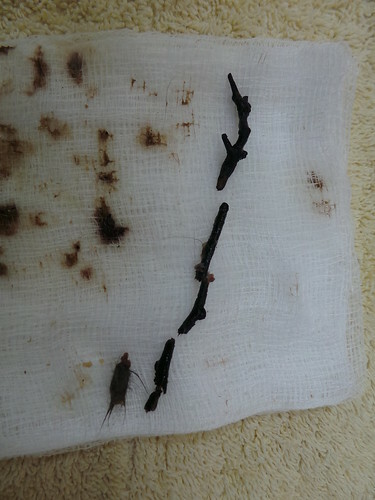 The rest of the stick was found to be poking out of the stomach. Liz was feeling quite disheartened to confirm that the stick had not only completely penetrated the abdominal cavity but was also perforating the stomach wall. A raging and brewing peritonitis secondary to contamination from the foreign body was now a serious cause of concern. And so we did not pull the plug on her and continued with the surgery. Mind you, this was all being conducted after-hours free of charge just because we knew deep down, this kitten deserved a chance. Our vet nurse Jayde also stayed behind and did a terrific job monitoring the critical anesthetic. I scrubbed in to assist Liz with the gastrotomy. We placed stay sutures and I held the stomach up while Liz extended the incision into the stomach wall and pulled out the stick. She then kept fishing out one foreign body after another. We could not believe our eyes. 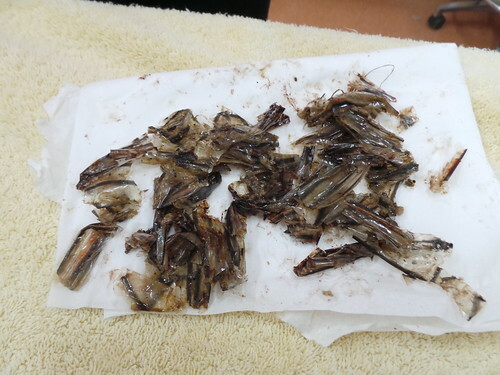 The content of her stomach consisted of tons of plastic and the rest of a twig. Here’s a short video of the kitten’s surgery. The poor baby was obviously starving and binging on the bacon factory’s waste bin. Her stomach was emptied and stitched back together. Liz then quickly removed her barely formed uterus as she was still fairly stable. She then closed up her abdomen and her very paper thin skin was stapled together. 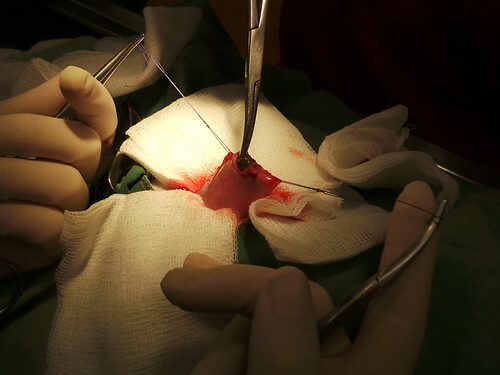 The moment of truth had arrived, most anesthetic deaths in our patients occur during the post-operative recovery period. We were focused on warming the patient up. Liz even managed to pop in an intravenous catheter so she could be given intravenous fluid therapy which will help increase the patient’s blood pressure. The odds were still against her and we waited anxiously for her to recover. She was very drowsy and unresponsive after the surgery. She was loaded on pain relief and antibiotics and all we could do now was just sit and wait. We looked at her petite stature and wondered if she would even survive the night. I went home with a heavy heart wondering if it was indeed the right decision to put her through all that if we couldn’t guarantee saving her life. 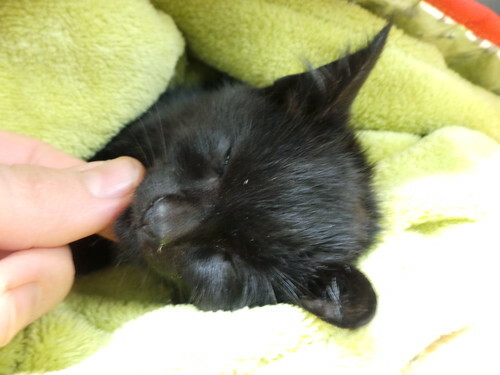 The next morning, I ran up to her cage as soon as I arrived at the clinic and she managed to give me a very weak meow. She was barely moving but was feeling much warmer and had a slightly pinkish tinge to her gums. Judy, our groomer, had even bought her a cat igloo that she was comfortably nestling into. 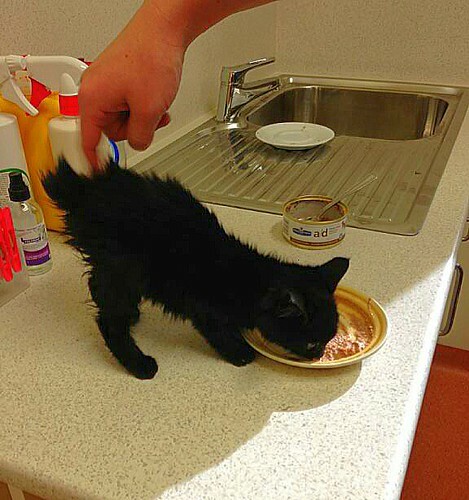 The poor little kitten looked so runty and weighed less than a half a kg. She was so malnourished and needed energy to enable her to start healing. However, we were flustered and knew it was too soon to feed her. In theory, we are trained to withhold food from our patients for 48 hours after a gastrotomy surgery. This time is needed to allow the stomach to heal. 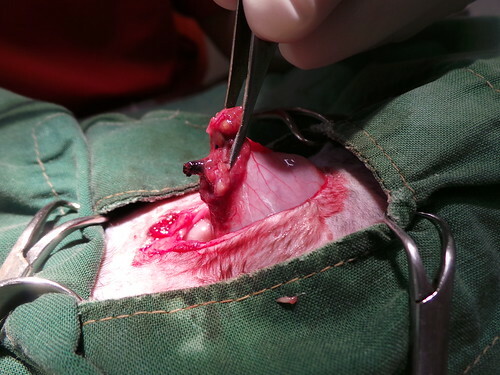 Otherwise, you risk stretching the sutures and predisposing the patient to a peritonitis secondary to leakage. We weighed out the pros and cons of not feeding her and Liz decided we could start her on a small amount of nutrigel (vitamin B paste). She quickly regretted feeding her. Why? Well the little kitten sparked up and almost took Liz’s finger off when she smelt the paste. I’ve never seen a kitten so psyched about nutrigel. A few hours later, she was offered a slurry of Hill’s a/d (liquid high energy food) and she hawed into it. She instantaneously looked much livelier. We crossed our fingers and toes and preyed the early feed won’t come back to haunt us. The next 24 hours were quite critical and so she remained in the vet hospital. And finally, our nameless stray kitten was named ‘Cleo’ and picked up by her saviors and new loving owners. A few days after being discharged, Liz called to check up on ‘Cleo’ and was informed she was doing really well. We are scheduled to see her this week and we are all super excited!!!!! I simply can’t wait to see her and cuddle her. This case should inspire veterinarians to never lose hope. 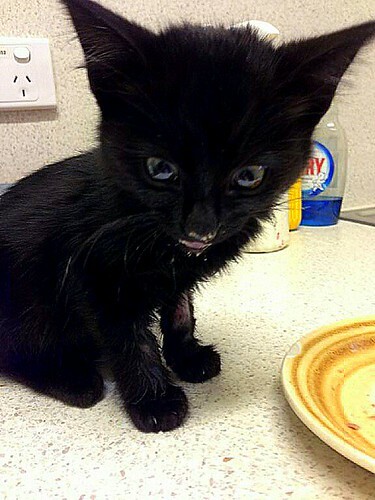 It never hurts to try and there is nothing worse than giving up too soon.This kitten defeated all the odds and managed to survive. It definitely now makes me a firm believer that cats must have nine lives. What a cool case! I probably would have been intimidated to try it myself, so it’s great that you had another vet there to help. Do you think she ate the stick and it perforated the stomach and abdominal wall by itself? Or was it actually coming out right at the umbilicus? What a wonderful story! You and your colleagues are angels to have saved that little kitten. I hope you’ll update us on her after you’ve seen her again. Such an amazing story, Rayya. 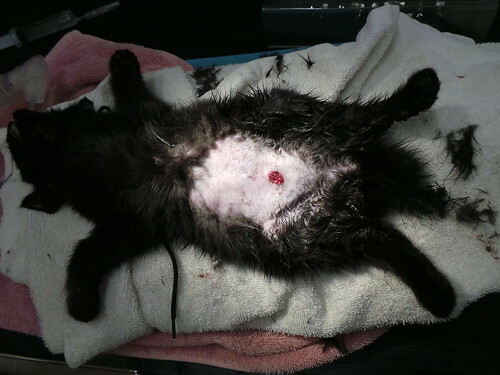 Now, that little kitten, was…..obviously meant to live. I’m also looking for an update (when you see this little kitten next). Thanks Vicki. It is a pretty out of this world story :-). We saw her today and she was doing brilliantly. She was full of energy and petrified of being at the vet clinic. Gawd. I can think of nothing else to say. Except I feel a little tearful. To life, dear Rayya! Yay for kitty poo! Congratulations on your great save. I hope to read more great updates! It’s so wonderful that you could save her. Poor little thing must have suffered so much. Seeing as Cleo cannot thank you and your friends whee feel whee should. You performed and miracle and you truly are angels. Actually, while whee are here whee have a quick question if you have time. Basil, our youngest little guinea piggy had an argument with his cagemate today which has resulted in a large cut to his top left lip. It is a little over 1cm long and goes right through the lip. It bled quite a bit and Mummy called the out of hours vet in a bit of a panic. They advised cleaning and seeing how it is in the morning. As he seems quite happy, can eat and drink alright and is now cuddled up with his cagemate whee think he is ok but do you think it is worth requesting some antibiotics in case of an infection and how can whee continue to keep it clean? With regards to Basil, I definitely think it is worth taking him in to the vet for a check. It’s all good signs that he is eating & drinking well. Lips generally heal really well as they have an excellent blood supply. The older the wound gets, the hard it is to operate on it if required. A quick oral exam will give your vet the best assessment to give Basil the best treatment. Hope this information helps. 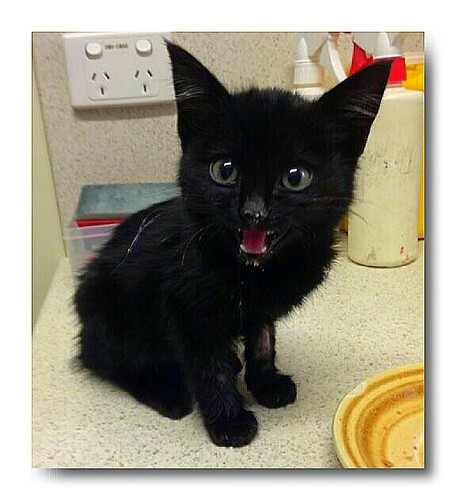 What an amazing story – and I must say that is one feisty little kitty, surviving against all the odds. So glad you took the time to give her a second chance at life, Rayya and Liz. Rayya i already commented on facebook but let me say again,this so truly sad,we owe our pets to look after them and to make sure they are desexed,if not then you must look after the babies when they come.When did we place so little value on the lives of animals that they are as disposable as a papercup.This man is my hero as are you and Liz and all the amazing people who stand up and advocate for the ones who need it most.I worry for the rest of the litter and their fate,i hope one day animals will be treated with the respect and love they deserve. Great job to all 🙂 and continued health to Cleo..she has cheeky in those eyes!! This is really a great story, Doctor! The Red Man always like to see baby creatures come back to life – even if they are C-A-T-S! 😉 Thanks for a job well done. I am so happy that Cleo made it through! She is a beautiful little girl. Once again I am just awestruck at the work that you do, and the skill and talent that you have. 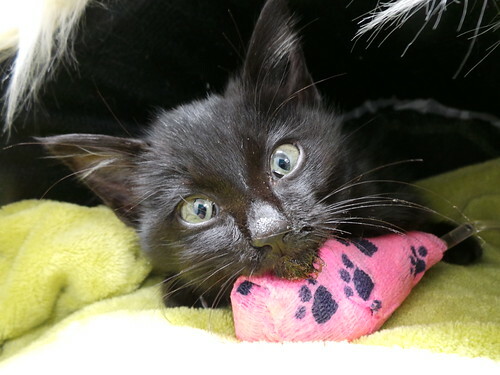 She is a very lucky little kitten – I look forward to hearing more about her new life. Well done! That poor kitten! It’s hard to imagine so much foreign material inside such a tiny body. How desperate do you have to be to eat plastic and twigs? I’m so glad she found her way to you and you were able to take care of her. She looks so different in those last pictures! I’m glad she’ll be able to live in a home with people who care about her and that she’ll be able to eat actual food instead of plastic and twigs! You are absolutely right, not every cat has 9 lives. Thanks Stefanie. I wish you a brilliant future and hope you achieve your goal of becoming a vet.